Moses in the Cradle is a popular house plant, related to the Wandering Jew plant. You'll find that it's just as easy to grow. 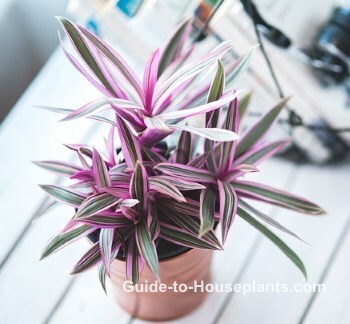 Dark-green, lance-shaped leaves with purplish-red undersides make this a beautiful house plant year-round. You can keep your plant indoors. But if you move it outdoors for the summer, keep it shaded from direct sun. Also, check the soil every couple days so that it doesn't dry out. Pot it in a small decorative container for a stunning table accent. A newer variety, Rhoea discolor 'Variegata' is even more spectacular, with striped foliage in burgundy, pink, green and cream. It blooms any time of year. 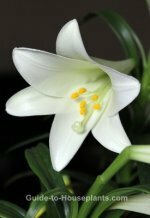 Small, white, 3-petaled flowers grow in the leaf axils, nestled in the boat-shaped leaves, giving this plant its common names, Moses in the Cradle, Moses in a Boat and Boat Lily. Let the sun shine in. Grow your plant in bright light year-round for good foliage color and flowers. It will tolerate lower light, but the leaves will be more green than purple. Raise the humidity in winter by misting the foliage with tepid water daily, or using a humidifier. Place the pot on a tray of wet pebbles to keep the air moist around it. Repot in spring when the plant becomes crowded, probably every couple years. Move up to a pot only 1 size larger to give it a little room to grow. Use a pot with drainage holes to prevent soggy soil, which leads to root rot. Tradescantia spathacea was formerly known as Rhoeo spathacea and is sometimes sold under that name in the nursery trade. You'll find it for sale from online nurseries and garden centers in spring and summer. Light: Bright light, but no direct sun. Water: Keep soil evenly moist spring through fall. In winter, allow the potting medium to dry out slightly between waterings. Humidity: Average room humidity. Brown leaf tips indicate that the air is too dry. Mist the foliage with room-temperature water or stand the pot on a humidity tray. Temperature: Average to warm room temperatures (65-80°F/18-27°C) suit this plant year-round. It will tolerate a minimum temperature of 55°F/13°C. Fertilizer: Feed monthly in spring and summer, while plant is actively growing. Propagation: Division. Remove offshoots with some roots attached and pot separately.